An implantation dip is a one-day drop in your basal body temperature (BBT) that occurs during the luteal phase, about seven to 10 days after ovulation. This drop is seen on pregnancy charts more often than non-pregnancy charts. But, whether you get one or not, it’s no guarantee that you’re pregnant. Here’s how to recognize an implantation dip on your BBT chart, what your actual odds are of being pregnant if you do get a dip, and what may cause it. What Is an Implantation Dip? 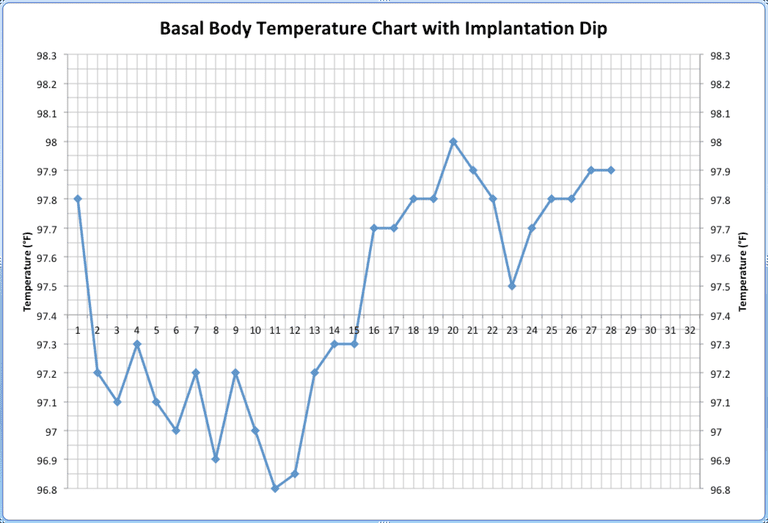 If you’re looking up information on implantation dips, then you likely already know the basics of basal body temperature charting. Here’s a very brief review of how basal body temperature charting works. To understand implantation dips, you need to know how hormones affect your basal body temp. Your basal temperature goes up a few tenths of a degree higher after you ovulate. The hormone progesterone—which increases after ovulation—causes the temperature jump. An implantation dip is a one-day drop in temperature on a basal body temperature chart that occurs about one week after ovulation. Usually, a dropping temperature is a sign that your period is coming or has even already arrived. Your period should not come just seven to 10 days after ovulation, so you wouldn’t expect a temperature drop at this time. The dip may just be slightly lower than the rest of your post-ovulation temperatures. Or, it may drop below the coverline on your fertility chart. The coverline is an imaginary horizontal line separating where your temperatures on average were before ovulation as opposed to where, on average, they are after ovulation. The dip appears during the luteal phase, the time between ovulation and your expected period. Also, implantation of the embryo usually occurs between days seven and 11 of the luteal phase. This is why some people attribute this sudden one-day dip in temperature to implantation. FertilityFriend.com, a free fertility charting online software company, did an informal analysis of the BBT charts on their site to see if an implantation dip might indicate pregnancy. Their analysis doesn't qualify as a scientific study, but the results are still interesting to consider. On non-pregnancy charts that detected ovulation, 11 percent had an implantation dip. On the other hand, 23 percent of pregnancy-positive charts had an implantation dip. Looking at their statistics, twice as many of the pregnancy charts showed an implantation dip. If your chart doesn't have a dip, you can't draw a conclusion. Approximately 75 percent of pregnancy BBT charts did not have the dip. Most women who were pregnant didn't get a dip. If you have the dip, does it mean you’re pregnant? No. The dip appeared on non-pregnancy charts. While you're more likely to see a one-day temperature drop when you're pregnant, it is not a definitive sign of being pregnant. Some women get a small dip on their charts almost every month on day seven or eight post-ovulation. Despite its name, we don’t know if embryo implantation causes the temporary drop in temperature. Given that non-pregnancy charts can have a dip, the phenomenon can’t be exclusive to pregnancy, so that probably isn’t it. One theory is that the hormone estrogen causes the dip. Estrogen peaks twice during your cycle. The first (and biggest) surge occurs just before ovulation. This estrogen increase leads to fertile cervical mucus and the boost in sexual desire. There is a second surge about midway through the luteal phase. (The luteal phase is after ovulation and before your next expected period.) This surge isn’t as high as the first, but it is still significant. Remember that progesterone raises your body temperature? Estrogen has a counter effect—it lowers your temperature. That second surge in estrogen may be why some women have implantation dips. Estrogen levels are higher in women who are pregnant. This could explain why the temperature decline is seen more frequently on pregnancy charts. However, even non-pregnant women get the secondary estrogen surge during the luteal phase. This explains why the dip appears on non-pregnancy charts. As an aside, some women notice a dip in temperature the day before they ovulate. This is also probably due to estrogen. In this case, the drop is caused by the primary estrogen surge that comes just before ovulation. Having an implantation dip is more likely when you are pregnant, but it is not a reliable sign of pregnancy. Generally speaking, your basal body temperature chart can't tell you with any certainty if you're pregnant. You need to take a pregnancy test to know for sure. You can still have fun looking for an implantation dip, but there's no reason to get your hopes up if you have one—or feel disappointed if you don't. Implantation Dip Study. FertilityFriend.com. https://www.fertilityfriend.com/Faqs/Implantation-dip-study.html. Can a Triphasic BBT Chart Be an Early Sign of Pregnancy? What Is the Luteal Phase? What Does It Have to Do With Ovulation? What Is a Corpus Luteum? How Does It Work? And What Can Go Wrong?